HOUDINI’S BIG LIFT IN BRADFORD. 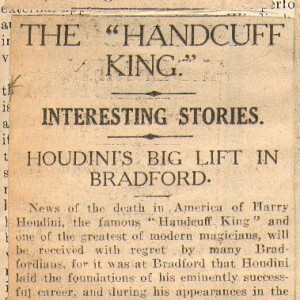 News of the death in America of Harry Houdini, the famous “Handcuff King” and one of the greatest of modern magicians, will be received with regret by many Bradfordians, for it was at Bradford that Houdini laid the foundations of his eminently successful career, and during his appearance in the city he had made a host of friends. Chief among them, perhaps, was Mr Jim Moffitt, of 123 Dudley Hill Road. 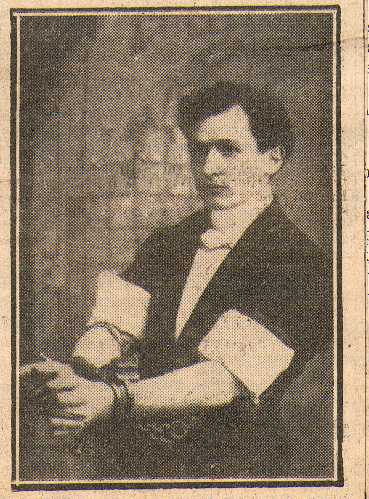 When Houdini first appeared at the Bradford Palace Theatre, shortly after the Boer War, Mr Moffitt, then a constable in the City Police Force, went on to the stage to test Houdini’s abilities as a handcuff breaker. 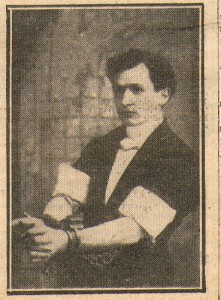 The incident lead to a friendship which has only now been terminated, and since that time Mr Moffitt has been in regular correspondence with the “Handcuff King” and has always helped him during his performances in the North of England. This suggests that to perform his tricks Houdini needed the assistance of someone to deceive the audience. Mr Moffitt assures us however, that such was not the case. There was always the chance that no member of an audience would respond to the usual invitation to step up to the platform and form a committee of inspection, Mr Moffitt therefore, always attended the performances to lead the way, and his response induced others to follow his example. Houdini was not a “faker”. All his tricks were genuinely performed, as a host of incidents will testify. How they were done remains a mystery, and one can only hint that Houdini was possessed not only of a wonderful mentality but also of remarkable physical owers, and amazing nerve control. Mr Moffitt told a “Budget” representative on Monday that he himself never appreciated the risks which Houdini ran, and imagined that his talk of danger was only showmanship until he assisted in a performance at Sheffield. The “Handcuff King” was tightly “laced” in a strait jacket. He managed, as usual, to escape from it, but he was completely exhausted and laid on the floor in a semi-conscious state for sometime afterwards. “I was nearly beaten there” he told Mr Moffitt afterwards, and the constable never afterwards smiled to himself when Houdini talked of the dangers he ran. 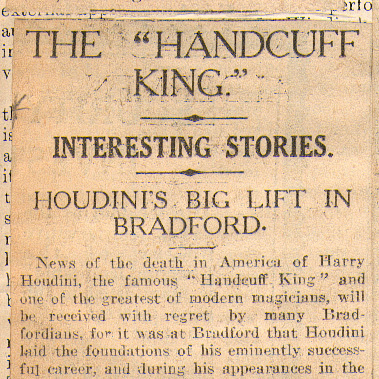 As a boy Houdini had worked with circuses, and prior to coming to Bradford he had figured in many small shows as a handcuff expert and as “The Card King” under which title he was billed. Then he came to the Bradford Palace, and it was success there that set him on the high road to fortune, and eventually gained him world-wide fame as “The handcuff King”. The Bradford Police were naturally vastly intrigued by Houdini’s tricks, and in those early days they tested him again and again. Placed in the prison cells, he escaped with ease. Handcuffed, and naked, he liberated himself in the presence of the Chief Constable and a number of police in the old police premises behind the site of the present Bradford Town Hall. His feats aroused tremendous interest in the district, and crowds of people, eager to test him, attended his performance, only to go away dumbfounded and talking about supernatural powers. At Leeds he was once confronted on the platform with a man who carried a pair of manacles which, according to Mr Moffitt who was present, must have weighed a stone, and were like “two big mantraps”. The Man adjusted them on Houdini’s wrists. He was very excited and kept shouting “I’ll fasten thee with these if tha’s nivver bin fastened afore.” Houdini simply pulled out a piece of string from his pocket, made a loop with it, and, inserting this in the lock, he drew the bolt. This feat was child’s play to him. There was one feat, however, that Houdini refused ever to repeat. He was placed handcuffed and chained into a milkcan filled by a well-known firm of brewers with beer. He emerged from it unfettered, but the fumes of the beer, he said, had almost overcome him. “I’ll stick to milk in future,” he declared, and subsequent performances were non alcoholic. It will not be generally known, by the way, that an apple pie started the “Handcuff King” upon his career. As a boy he was inordinately fond of apple pies, and especially of those his mother baked. To keep them out of his reach she used to lock them away in a cupboard until one day the boy, feeling particularly peckish, tackled the lock and picked it with an ease that even surprised himself. It dawned upon him then that he possessed unusual powers. After that no door could bar him and as he grew older he mastered more difficult feats one by one. Mr Charles Mozley, another of Houdini’s Bradford friends, called today, incidentally, to show us a letter in which Houdini declares that his first appearance at the Bradford Palace was on Monday, February 4. 1901.